A fascinating and insightful article that initially really got my back up but then with calm reflection I think this could be a great thing for the recruitment industry. In my view, LinkedIn has been the worst thing to happen to the recruitment industry. It has allowed low level, unqualified, money hungry people that call themselves "consultants" to lower the bar of quality and create a reputation most of us actively avoid on a daily basis! Searching a database, that is what LinkedIn is, for potential candidates has nothing to do with consultancy and requires very little skills or even intelligence. Furthermore our belief is that only around 40% of potential candidates are actually active on Linked In and that reduces the higher up the hierarchy you need to recruit. I agree that machine learning could replace "recruiters" to generate candidates for common roles or ones where the sought experts are actually registered on the likes of LinkedIn or are users of social media but at the Executive Level there will still very much be the demand for skilled consultants who can help shape board rooms. Operating at this level is all about personal interaction, building robust networks, understanding the intimacies of clients and their industries and having a range of leading edge assessment tools at your disposal to help organisations to make the right decisions. The last recession was amazing and a huge success for Collingwood as our clients did make large scale redundancies but then invested in THE highest calibre leaders we could entice, engage and secure for them. None of these candidates would have come up on any social media or Linked In search suggesting that they were "ripe" for a move. 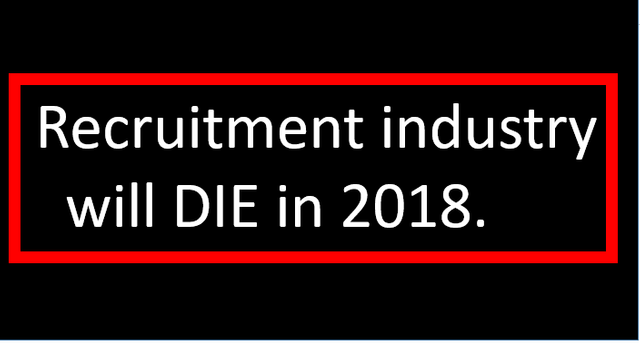 Looks like the recruitment industry will be cleaned up in 2018 but there will still be a place for Consultants who add value to our clients. I reckon the industry has about 2 years left in it, 4 at most. Machine learning, big data, propensity algorithms can deal with vast networks of connections much better than a human can. Critical mass of the new tools, some of which are available now, will arrive by 2018 right when the next recession is predicted to occur. That's when the companies and internal recruiters will start pulling back on the recruitment agencies fees, and using the new tools en-mass. Once on the tools, they are not coming back, ever. The latest algorithms can predict when someone is ripe for a new job based on time in the job and social media activity, and even purchasing history. The latest text analysis algorithms can pick out skills and experience much better than humans can, about 10 million faster.